Probably commissioned by Bartolommeo Bartoli (or di Bartolo), Bishop of Cagli [d. 1497]; by gift from him to the church of San Domenico, San Gimignano; seized 1796/1797 by Napoleonic troops; acquired 1796/1797 by Dr. Buzzi, and sold soon thereafter to Prince Alexander Mikhailovich Galitzin [1772-1821], Russian ambassador to Rome; by inheritance to his son, Theodore Alexandrovich Galitzin [d. 1848], Palazzo Galitzin, Rome; by inheritance to his nephew, Sergei Mikhailovich Galitzin [1843-1915], Moscow; displayed from 1865 at the Museum of Western European Painting of Prince S.M. Galitzin, Moscow; purchased 1886 with the Galitzin collection by the Imperial Hermitage Gallery, Saint Petersburg; purchased April 1931 through (Matthiesen Gallery, Berlin; P. & D. Colnaghi & Co., London and New York; and M. Knoedler & Co., New York and London) by Andrew W. Mellon, Pittsburgh and Washington, D.C.; deeded 5 June 1931 to The A.W. Mellon Educational and Charitable Trust, Pittsburgh; gift 1937 to NGA. The frame on the painting is modern and thus the coats-of-arms decorating it have no bearing on the provenance. A.A. Vasilchikoff, "The Artworks of Raphael in Russsia," Viestnik iziashnych iskusstv [Fine Arts Herald] I, no. 3 (1883): 390-393, provides this history of ownership. He also notes that Buzzi had the French artist Baron François Xavier Fabre treat the picture, and that after Theodore Galitzin's death, the painting languished in a storage closet of his palace until 1862. According to Brüiningk and Somov (E. Brüiningk and Andrei Ivanovich Somov, Ermitage Impérial. Catalogue de la Galerie des Tableaux. Les Écoles d'Italie et d'Espagne, Saint Petersburg, 1891: 134), a Livornese painter named Gazzarini offered a somewhat different account of the pre-Galitzin ownership of the picture, which cannot today be substantiated. See also R.P. Gray, "The Golitsyn and Kushelev-Bezborodko Collections and their Role in the Evolution of Public Art Collections in Russia," Oxford Slavonic Papers n.s. 31 (1998): 54-57 [51-67]. Mellon purchase date and date deeded to Mellon Trust are according to Mellon collection files in NGA curatorial records and David Finley's notebook (donated to the National Gallery of Art in 1977, now in the Gallery Archives). Raphael and America, National Gallery of Art, Washington, D.C., 1983, no. 52, pl. 7. 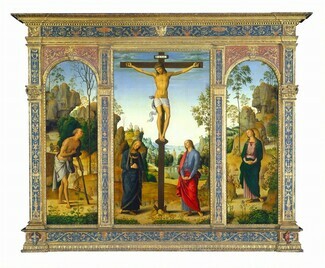 The Flowering of Florence, National Gallery of Art, Washington, D.C., 2002, no. 4, repro. Golitzyn Museum in Volkhonka Street, State Pushkin Museum of Fine Arts, Moscow, 2004. Preliminary Catalogue of Paintings and Sculpture. National Gallery of Art, Washington, 1941: 148-149, no. 27. Book of Illustrations. National Gallery of Art, Washington, 1942: 239, repro. 164. Paintings and Sculpture from the Mellon Collection. National Gallery of Art, Washington, 1949 (reprinted 1953 and 1958): 25, repro. Einstein, Lewis. Looking at Italian Pictures in the National Gallery of Art. Washington, 1951: 54-57, repro. Cairns, Huntington, and John Walker, eds., Great Paintings from the National Gallery of Art. New York, 1952: 36, color repro. Shapley, Fern Rusk. Early Italian Painting in the National Gallery of Art. 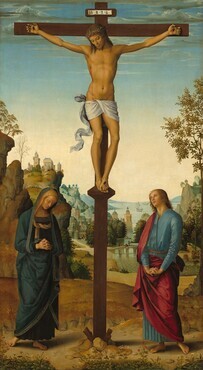 Washington, D.C., 1959 (Booklet Number Three in Ten Schools of Painting in the National Gallery of Art, Washington, D.C.): 32, color repro., as The Crucifixion with Saints. The National Gallery of Art and Its Collections. Foreword by Perry B. Cott and notes by Otto Stelzer. National Gallery of Art, Washington (undated, 1960s): 24. Walker, John. National Gallery of Art, Washington, D.C. New York, 1963 (reprinted 1964 in French, German, and Spanish): 88, repro. Summary Catalogue of European Paintings and Sculpture. National Gallery of Art, Washington, 1965: 100. Cairns, Huntington, and John Walker, eds. A Pageant of Painting from the National Gallery of Art. 2 vols. New York, 1966: 1:122, color repro. European Paintings: An Illustrated Summary Catalogue. National Gallery of Art, Washington, 1975: 262, repro. Shapley, Fern Rusk. Catalogue of the Italian Paintings. 2 vols. Washington, 1979: I:360-361, II:pl. 259. Watson, Ross. The National Gallery of Art, Washington. New York, 1979: 32, pl. 15. Walker, John. National Gallery of Art, Washington. Rev. ed. New York, 1984: 106, no. 77, color repro. European Paintings: An Illustrated Catalogue. National Gallery of Art, Washington, 1985: 302, repro. Kopper, Philip. America's National Gallery of Art: A Gift to the Nation. New York, 1991: 91, 92, color repro. National Gallery of Art. National Gallery of Art, Washington. New York, 1992: 23, repro. Neverov, Oleg, and Mikhail Piotrovsky. The Hermitage: Essays on the History of the Collection, Saint Petersburg, 1997, p. 166, repro. Christiansen, Keith. "The View From Italy." In From Van Eyck to Bruegel: Early Netherlandish Painting in the Metropolitan Museum of Art. Edited by Maryan W. Ainsworth and Keith Christiansen. Exh. cat, Metropolitan Museum of Art, 1998. New York, 1998: 41-43, fig. 22. Boskovits, Miklós, David Alan Brown, et al. Italian Paintings of the Fifteenth Century. The Systematic Catalogue of the National Gallery of Art. Washington, 2003: 552-556, color repro. Hand, John Oliver. National Gallery of Art: Master Paintings from the Collection. Washington and New York, 2004: 34-35, no. 24, color repro. Neverov, Oleg Yakovlevich. Great Private Collections of Imperial Russia. New York and Saint Petersburg, 2004: 42-43, ill. 41. Hartt, Frederick, and David G. Wilkins. History of Italian Renaissance Art: Painting, Sculpture, Architecture. 6th ed. Upper Saddle River, 2006: 377-378, color fig. 14.19.